An increase in wind speed from pre-fishing earlier in the week played havoc for many of the anglers on Rainy Lake during Day 1 of the Fort Frances Canadian Bass Championship yesterday. But for the local team of Darren Ward and Sean Good, the condition changes ended up playing right into their favour as they jumped to the top of the table following the first day of fishing, with their five bass weighing in at 19.61 pounds. An explosive vocal duel between Charity Alverson and Brittany Hayes put the exclamation mark on an evening packed with musical artistry during the annual “Quest for the Best” singing competition last night. A total of 95 boats launched from the government dock at Pither’s Point this morning to begin their quest for the 17th-annual Fort Frances Canadian Bass Championship crown. As the anglers waited to go on the water at the Sorting Gap Marina, both newcomers and seasoned FFCBC competitors alike were feeling exactly the same. With the 2011 edition of the Fort Frances Canadian Bass Championship edging ever closer, new chairman Gord Watson is looking to return the event to its roots. Watson, who took over the reins from Tom Fry back in October, has been working hard with the rest of the committee over the last few months to set up this year’s event, which will run July 17-23. The Fort Frances Canadian Bass Championship will be hosting an Open House Thursday February 3 at La Place Rendezvous. The Tournament now has over 65 teams registered for the 2011 Tournament Days. The new directors and team of this year’s tournament look forward to meeting and discussing the many changes that are being introduced in this year’s format. 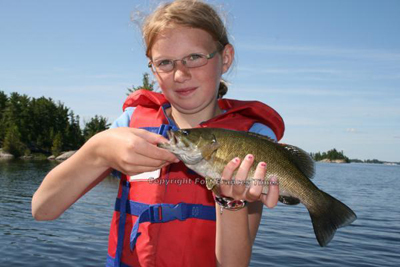 In response to suggestions from previous competitors changes have been made to the 2011 Fort Frances Canadian Bass Championship (FFCBC) format and prize board. The field is capped at 120 teams. The entry fee remains $1,000.00 per team and the prize board pays out 85% of the total entries. That means that at a full field of 120 teams the total cash payout will be $102,000.00. Day One and Day Two will payout for Big Fish and top three catches. Day One and Day Two will each pay out $4,500.00. 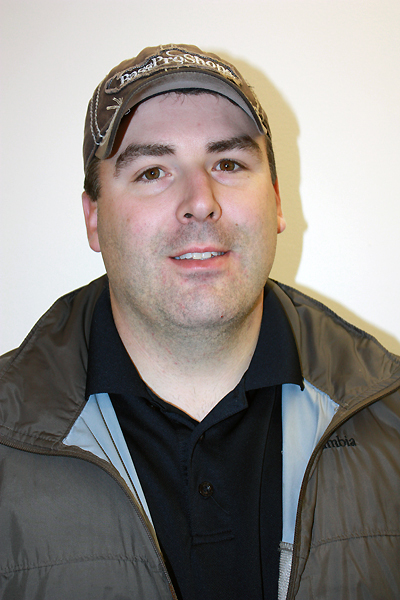 Gord Watson, chairman of Fort Frances Canadian Bass Championship (FFCBC), announced the appointment of Paul Jewiss as Anglers’ Representative on the FFCBC Board of Directors. The newly created position brings a formal angler voice to the board table with full voting rights. Jewiss will establish an Angler Advisory Committee that will encompass a cross-section of tournament competitors. Jewiss will be fishing in his 11th FFCBC in 2011 and competes in other regional tournaments. 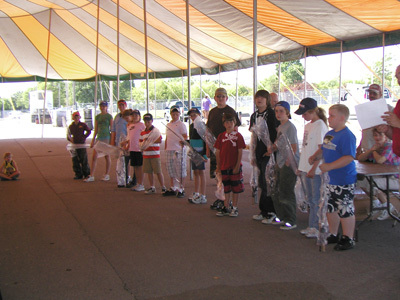 Fort Frances Canadian Bass Championship (FFCBC) will offer an early bird prize to teams that enter the 2011 tournament by December 20, 2010. Every team that enters by the deadline will be entered in a draw for a free entry to the 2012 event. The draw will take place on December 24, 2010. Anglers can find an entry form on line at canadianbass.com. Anglers have option of printing off an entry form and mailing it in, faxing it in or dropping it off at The Great Bear and at the Fort Frances Times office. 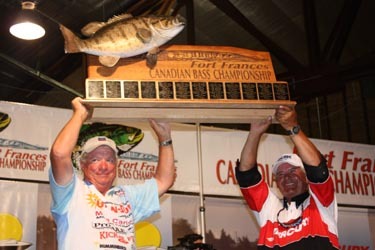 The Fort Frances Canadian Bass Championship (FFCBC) will adopt a new format for 2011. Gord Watson, the incoming chairman, recognized that some changes had to be made when he assumed the chair. He knew that he had to start by increasing angler participation. Last year, in 2010, 106 teams participated. That was a 13-year low in the sixteen year history of the tournament. He picked up the phone and started talking with anglers. He also closely examined a feedback and suggestion survey of about 30 anglers that was conducted after the 2010 tournament. Gord Watson only took over as chairman of the Fort Frances Canadian Bass Championship at an emergency meeting Thursday (October 21st) night, but in that span he already has begun a lot of groundwork for the 2011 tournament next July. October 13, 2010. 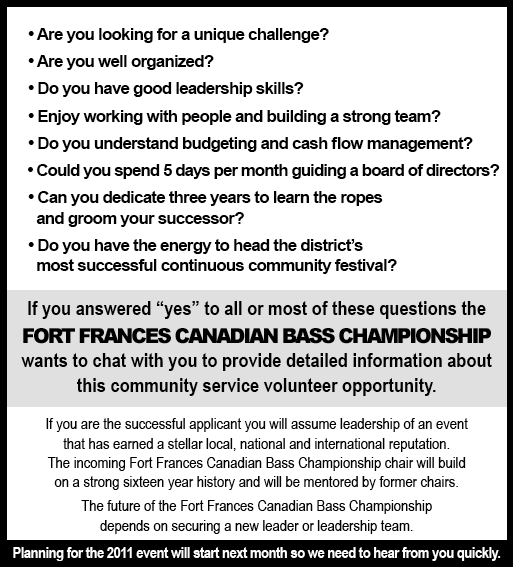 The future of the Fort Frances Canadian Bass Championship, the most recognizable community festival in the district, depends on securing a new chairperson for the event. Tom Fry, who has served a chairman for the past three years, is retiring. Fry has been an active volunteer and part of the tournament since its beginnings in 1995. At this point, despite approaching many individuals, advertising on radio and in the paper, no replacement has come forward. Please contact Tom Fry to schedule a meeting. Troy and Al Lindner bring in 3 large mouth bass to 2010 Tournament. Dorian Lindholm and Bill Wilcox win 2010 FFCBC with 56.45 lbs. 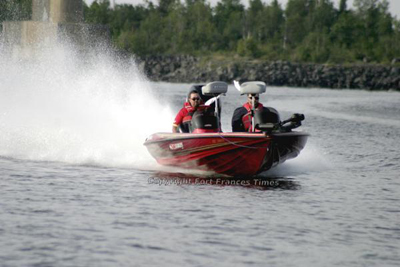 It was the end of a couple of streaks Saturday at the Fort Frances Canadian Bass Championship. “It feels great,” enthused Lindholm, whose three-day team total of 56.45 pounds topped runners-up Mark Raveling and Mike Luhman by more than three pounds. 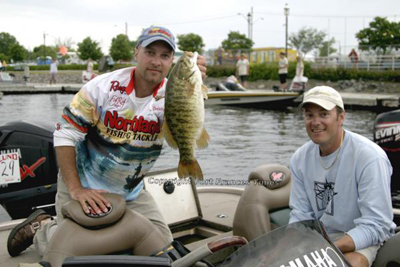 Read more about Dorian Lindholm and Bill Wilcox win 2010 FFCBC with 56.45 lbs. Fort Frances April 27, 2010 To attract more first time teams, the Fort Frances Canadian Bass Championship has created new prizes for the 2010 tournament. Fort Frances Canadian Bass Championship chairman Tom Fry today announced significant changes to the prize board of this year’s championship. The prize board with 125 teams entered will total $107,500 with the first first place prize amounting to $25,000. The early bird draw of $1000 for those teams who paid their full registration prior to November 2009 will take place at the rules meeting on Tuesday night July 20. Mercury Marine today announced that they have renewed their support for the Fort Frances Canadian Bass Championship held annually in Fort Frances for 2010. Since its beginnings in 1995, the Tournament and Mercury Marine have promoted this competitive tournament in North Western Ontario. Ryan Sproule, special events coordinator on behalf of Lund Boats Canada, announced that Lund Boats had renewed their partnership and sponsorship of the Fort Frances Canadian Bass Championship. 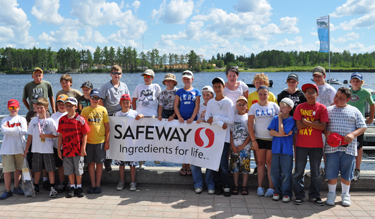 Canada Safeway announced that once again they would be sponsors of the Safeway KidPro, which kicks off the Fort Frances Canadian Bass Championship on Sunday July 18, 2010 from the Sorting Gap Marina in Fort Frances. This marks the fourth year that Canada Safeway has been the Safeway KidPro sponsor. 2010 Tournament is a go!! Information will be mailed to 2009 team captains by October 31. 2010 Entry forms will be available online soon. Check back for tournament updates. Read more about 2010 Tournament is a go!! FFCBC Anglers will be recieveing a mailing containing 2010 information before the end of October. Entry deadline will be extended. This delay is a result of difficulties in filling volunteer board of director positions. The new and returning directors in place for 2010 have decided to proceed with a 2010 event, only if all the director vacancies are filled. Joe Thrun and Jim Moynagh cemented their claim as the best tandem in Fort Frances Canadian Bass Championship history by winning their third-straight title, and fifth overall, on Saturday to conclude the 15th-annual event. By Mitch Calvert, Fort Frances Times LTD.
Matt Christy of Superior, Wis. and partner Chris Hay of Brooklyn Centre, Mn. had a great day on the waters of Rainy Lake yesterday after bringing in an 18.88-pound bag to sit in second place behind defending champs Jim Moynagh and Joe Thrun after Day 1 of the 15th-annual Fort Frances Canadian Bass Championship. Chad Buist and Rick Cooper of Fort Frances (Team #141) roared out from under the Causeway en route to the north arm of Rainy Lake this morning to begin the 15th-annual Fort Frances Canadian Bass Championship. FORT FRANCES—A field of 124 teams took to the waters of Rainy Lake early Thursday morning to kick off the 15th-annual Fort Frances Canadian Bass Championship. Conditions have been far from ideal for those teams pre-fishing ahead of tomorrow’s start of the 15th-annual Fort Frances Canadian Bass Championship. Cold rains and strong winds haunted anglers all last week before briefly subsiding over the weekend—only to return in full force again Monday and Tuesday during the last couple of days teams were allowed to test the waters. By Elisabeth Heslop, Fort Frances Times LTD. The day of the 11th-annual “Kid-Pro” tournament dawned sunny and warm, boding well for the 14 youngster who gathered under the big tent at the Sorting Gap Marina on Sunday morning to meet their pro angling partners. As the third of her siblings to participate in the tourney, 10-year-old Harleigh Brow-Rose knew something of what to expect—her two older brothers had told her stories of their experiences. Now it was her turn.